IT’S OFFICIAL: ADVERTISING IS DEAD! AGAIN! OMG, We’re all going to die! Adblock plus has killed advertising on the Internet! The whole economy has fallen down and it can’t get up. Or at least, that seems to be what Andrew Leonard is implying in his Salon article, “The Internet’s next victim: Advertising.” Undeniably it is a fact that we are all going to die, but advertising? Don’t hold your breath. It’s not that Adblock isn’t a game changer, it’s just that dire warnings from the ghosts of advertising past are invading my brain. “Readers can flip through magazines; print advertising is dead.” “Push buttons make it too easy to change radio stations; radio advertising is dead.” “The Mute button (now the DVR) means people can ignore TV commercials; television advertising is dead.” “Cars on the freeways speed past billboards; outdoor advertising is dead.” In the past 30 years, I’ve heard that advertising has died so many times, I can’t believe it doesn’t have its own Easter. To prove his point, Leonard quotes Till Faida, CEO of Adblock Plus, “Everyone agrees that advertising on the Internet is broken.” Of course, that is reines Scheiße*, not everyone agrees on anything in advertising… but he does have a new product to flog, (or initiative if you will) and stretching the truth in advertising and PR isn’t exactly unknown, so I’ll forgive that. But this isn’t supposed to be an AdBlock Plus PR piece, so allow me to rant a bit in opposition. Let’s start with “that apocalyptic scenario.” The end of advertising, dogs and cats sleeping together, and total protonic reversal. Bang: “I’m on a horse” for Old Spice. Boom: The coffeehouse prank for Carrie. And Gasp: the unforgettable and hauntingly beautiful “The Beauty Inside” web ad series (all 6 episodes) for Toshiba and Intel. None of those ads could ever have existed outside of the Internet. 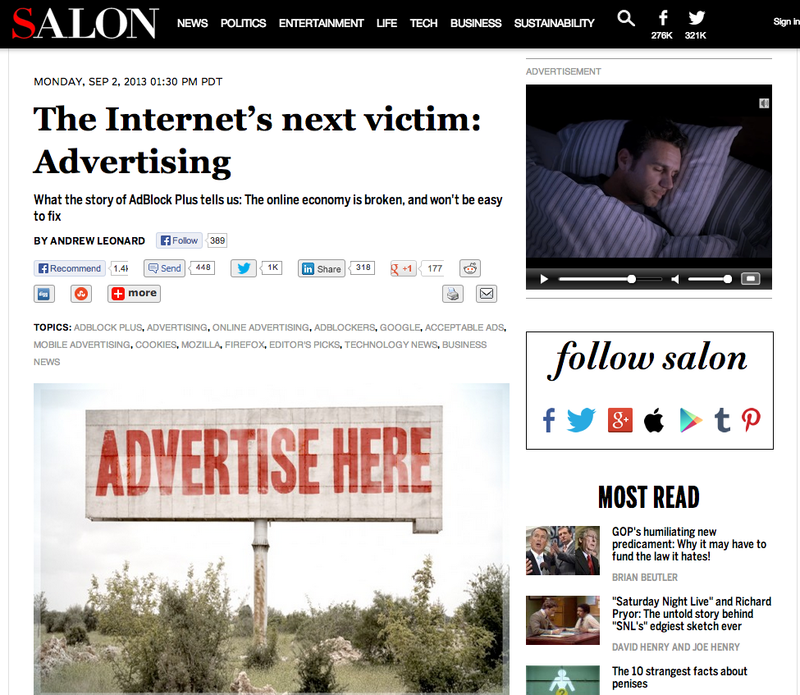 And without a doubt if the subject of the Salon article had been, “The Internet has shaken advertising to it’s core, and it will never be the same,” I would be singing its praises. But dead? I should be so dead. Since these ads are so stupid, users click less and revenues go down. An advertising agency might suggest, “make better ads,” but no, apparently web advertisers are forced to run ever more “aggressive” ads that are so consummately stupid, that revenues go down even further. The Adblock Plus solution: charge big advertisers a fee to not block some of their ads. Um, because those would be … more acceptable … Sounds legit. Leonard then wonders whether a world full of “acceptable ads” might not only be not annoying but also easy to ignore. “And if advertising is easy to ignore,” he points out, “it doesn’t work.” This makes my brain hurt. I feel obliged to quote Leo Burnett here, “There’s no such thing as hard sell and soft sell. There’s only smart sell and stupid sell.” Annoying advertising is stupid. Easy to ignore is stupid. Smart advertising, by definition, is not easy to ignore. And, oh by the way, then there’s that whole revolutionary concept of engagement that the Internet makes possible. Online, you have the ability to do things that are so much more powerful than any kind of conventional advertising, online or off, that the whole issue of banner ads is rendered moot. A campaign can reach out to customers through email, interactive websites, mobile sites and e-magazines, or with blogs and bloggers, and useful apps that keep you at their fingertips even when they’re not immediately in the market for whatever it is you have to sell. Dead? Hell! Online advertising is not dead, not injured, not even limping, but it is changing the way we think about the entire concept of communication. It is exciting, invigorating, occasionally maddening, and always changing. ORIGINAL POST FROM PADV “No Bull” email.